Banana Republic has a surprisingly nice selection of fragrances that usually tend to sit on the simple and easy side of things but that doesn’t discount them from making some pleasant on the nose scents that are versatile and pretty easy to wear. In Bottle: Classic smells like a green, clean machine. Reminiscent of the sticky sap of a banana tree. But it’s really just a fantastic blend of limes and leaves. Applied: Jolt of green citrus that harkens in the clean and fresh immediately. Classic reminds me of how fresh laundry and clean clothes should smell. I know people out there like the smell of clean laundry and there’s quite a few fragrances that can pass themselves off for that. Classic is one of them. No one can accuse you of being smelly with this on as it’s so incredibly inoffensive. Nothing more than fresh, clean citrus at first with a subtle hint of florals as the fragrance progresses. The white florals balance the citrus as Classic heads into its dry down of gentle white musk and sandalwood. Extra: Banana Republic is a mid-range fashion brand. The term Banana Republic also refers to unstable countries whose chief means of finances tends to be some sort of agricultural product. The two are obviously not related. Design: Classic comes in a rectangular bottle with a metal cap affixed to the top. The cap and the sprayer are a type of brushed metal. No thrills or frills with Classic. It’s just simple, easy to hold, and can be purchased in the slightly larger 125ml version rather than the usual 100ml you often see. Notes: Lime, mandarin, bergamot, orange, grapefruit, white florals, musk, sandalwood. 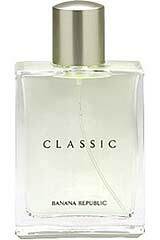 Classic came out in 1995 and is a generally lovely fragrance for office and other purpose wear when you don’t want the other person to know you’re wearing perfume. I can often feign a pleasant smelling soap with this stuff. The other thing about Classic is it tends to have terrible longevity on me. We’re talking on for an hour and gone before you know it. I assume this is due to the predominance of citrus in the fragrance but it’s only a guess. Reviewed in This Post: Classic, 2010, Eau de Toilette. This entry was posted in banana republic, citrus, fresh, Reviews By House and tagged banana republic, blog, citrus, classic, clean, fragrance, fresh, green, laundry, lime, nineties, perfume, review, scent. Bookmark the permalink.